“Test, commit, push, deploy” – You’ll hear a lot of new words getting shouted over the din of the trading floor at the NYSE tomorrow. 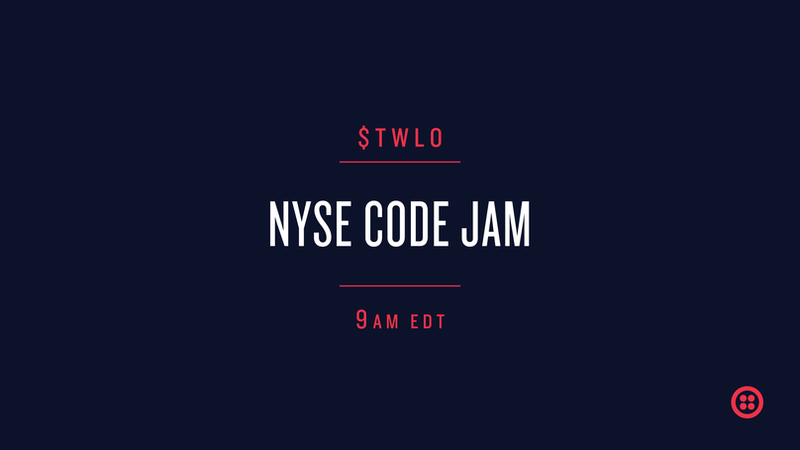 Starting at 9:00 AM EDT / 6:00 AM PT / 1:00 PM GT they’ll design, develop and deploy as many Twilio apps as they can. Watch them in action live on Twitch.tv. We’ll be breaking down what powers their apps, how you can build them, and a few special surprises. See you tomorrow on Twitch. The offering of Twilio’s Class A common stock is being made only by means of a prospectus. A copy of the final prospectus may be obtained from Goldman, Sachs & Co., Attention: Prospectus Department, 200 West Street, New York, NY 10282, telephone: 1-866-471-2526, or email: prospectus-ny@ny.email.gs.com; and from J.P. Morgan Securities LLC, c/o Broadridge Financial Solutions, 1155 Long Island Avenue, Edgewood, NY 11717. A registration statement relating to these securities has been filed with, and declared effective by, the Securities and Exchange Commission. This communication shall not constitute an offer to sell or the solicitation of an offer to buy, nor shall there be any sale of these securities in any state or jurisdiction in which such offer, solicitation or sale would be unlawful prior to registration or qualification under the securities laws of any such state or jurisdiction.